OK, so far I've a number of issues..
Firstly and most importantly is my bill which has recently came through and I've only just had chance to look at. I have been charge a €99.99 installation fee. I specifically told the representative on the chat when I was about to sign up that I am not going to pay €99.99 for installation. The chat representative took a moment to consult with her manager and confirmed that on this ocassion it would be OK and that in this instance you'd waive this charge., I took a screenshot for my own records so I expect you to honor this. I used to be a customer years ago with an ADSL connection, then I changed to be on 'a months notice' with a different provider. Finally Eir pulled their finger out and installed FTTH and so I was with them for a year before coming back to Vodafone. Logging back into this community wasn't exactly straight forward as my email address was already in use from the last time I was with you. Maybe this is also something that you'd like to look into as I'd guess your going to be picking up more and more fibre customers who have been unhappy with Eir. One of my biggest complaints with Eir is that you could never get to speak to anybody and the people on chat weren't able to help in most cases. Well.. admittedly today is a Friday, I couldn't even get through to you on chat! "All agents are busy at the moment. Please try again later." so this is the first instance that I've needed to contact anybody and the only method I have to do so is by leaving this post on here - not very happy. Maybe someone will get back to me shortly? Mods wont be back until Tuesday to help. If you've evidence they'll honour the deal they made. You've the forum, live chat and a phone call as customer support so hopefully one of them will be able to assist. 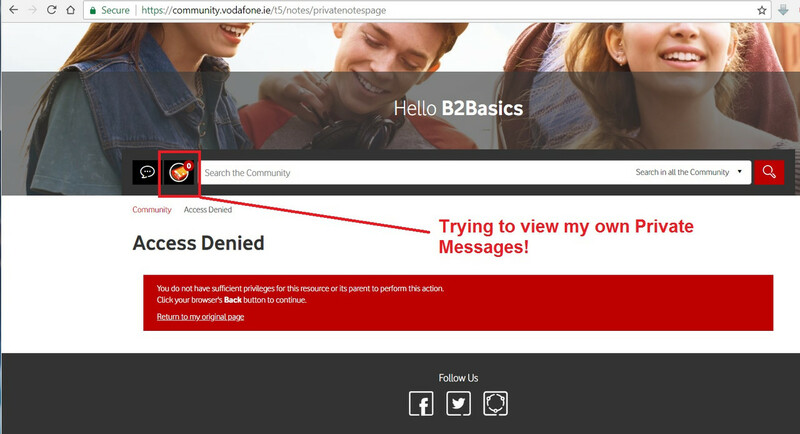 I was actually trying to do Vodafone a favor by not publicly posting the evidence as I'd imagine it could be used by others. Ok, I'll wait until Tuesday, hope everyone has a nice weekend. Well.. it's 17:30hrs on Tuesday, so pretty much Tuesday has been and gone with no reply from a Moderator nor any further comments on my thread.. Yes, I'm feeling a little lonely and uncared for..
Whilst on the topic of things not working, why when I try to check my own Private Messages do I get this? Well hopefully somebody in the know will reply to me? Who knows? Mods answer queries in the order they are received. Please be patient and they will get to you. You could try live chat. To use live chat click support at the top of this page then choose the service you need support with (bill or pre pay. etc..). Click CHAT icon that pops up in the bottom right hand corner of the next screen. In addition to trying to call 1907 (nobody there, call back scheduled for today), I tried the web chat (unavailable as all busy) so I thought I'd screen record attempting to send a PM.. as you will see, what exactly am I supposed to do. This is SO frustrating. OK, so to my surprise my 10AM call back was honored and I've been speaking to a very helpful representative who was very professional and has handled all of my issues except the PM sending, but I've had to email her with those details so hopefully that will be sorted out in due course. As for moderators moaning about staying 'on-thread' then yes, I totally agree UNLESS that was the last option that I had so please now get over it. Thankfully I wish to close this thread and hope to never have to come back here. You started the post on the 15th of a bank holiday weekend where mods were not back till the 19th (yesterday) to respond to queries. They will get to you. Try be a bit more patient.